As summer approaches and we rush headlong into wedding season, more than a few glasses of Champagne will be raised, despite the country being in the throes of a double dip recession. In fact, we in Britain can't get enough of the stuff and are right up there as one of the world's biggest consumers, second only to France. Even in the midst of a global recession, we continue to quaff it in vast amounts, although admittedly, the market has seen a downturn over the last three years and this year, for the first time, sales of alternative, sparkling fizz will exceed those of Champagne. Of course, this is largely due to cost, Champagne generally being the more expensive option, but it can't be denied that some of the pretenders to the title of 'King of Wines', have a pretty good claim. I myself am no stranger to the charms of Champagne, but in all honesty, when it comes to taste, I prefer a Prosecco, providing it isn't too sweet. The crisp apple and peach notes of the Italian interloper are, in my opinion, far more palatable and don't dry the mouth to leave a sour taste. That said, nothing quite says it like a bottle of Champers! Funnily enough, the one thing (well, other than the hefty price tag) that makes Champagne instantly recognisable, is its effervescence - after all, surely without the bubbles, it is just a very dry wine - but did you know that Champagne was originally a still wine? 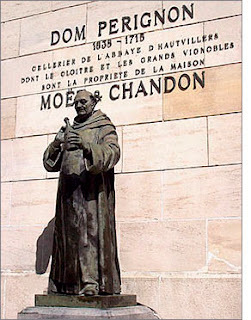 In fact, Dom Pierre Perignon, widely recognised as the mac daddy of Champagne, actively sought to eliminate the troublesome bubbles from his fine wine. Apparently the wine of the Champagne region was bottled in autumn, but by spring, the warmer temperatures could bring about a secondary fermentation process that caused bubbles to form in the wine. Rather than be appreciated, this 'mousse' was considered a fault and could actually prove to be a costly, even dangerous error, when the bottles sometimes exploded. Pierre Perignon, during his lifetime, was fastidious in his methodology for ridding his wine of bubbles, but luckily for us his faulty brew grew in popularity and with celebrity endorsements from the French nobility in the 18th century, it became associated with wealth and luxury. When it comes to drinking Champagne or any other sparkling wine, it really is worth choosing your glass carefully. Why fork out so much money on a bottle of fizz that will be finished before the night is out, only to lessen the enjoyment by using an unsuitable glass? Champagne glasses traditionally come in two styles; the flute and the saucer. The Champagne saucer or 'coupe' as it is called in France, has an open, flattened bowl which, legend has it, was modelled on the breasts of Marie Antoinette. Amusing as this is, sadly, it is unlikely to be true. Marie Antoinette may week have been possessed of perky, round breasts, but the glass style had been in existence long before her lady bumps ever were. The Champagne coupe was the glass of choice in the 1930's and continued to be so, up until the 1960's, perhaps because it actually held a large amount of liquid, adding to the already decadent image of the drink. However, the wide surface area of the open style saucer allows the bubbles to dissipate at a rapid rate, leaving the drinker with a glass of fizzless fizz, which is no fun at all. The Champagne flute is widely recognised as the superior design when it comes to enjoying your bubbly, but within this category, there are numerous variations on the theme. One of my personal favourites from a painting perspective, is the hollow stemmed Trumpet flute as it provides a really attractive shape for my designs. However, I have stopped using them as unfortunately, the hollow stem means that the heat of one's hand is transferred to the liquid, warming the Champagne within. The style that best enhances the enjoyment of the drink is a solid stemmed glass with an elongated bowl with a smaller opening (unsurprisingly, no-one ever laid claim to it being modelled on their breasts).The smaller the surface area exposed to the air, the less effervescence and aroma you will lose. The longer bowl will allow the bubbles to travel upwards which is both visually pleasing and delivers the aroma to the nose, enhancing the taste. So what will you be drinking this summer - Champagne, Cava, Asti or Prosecco? Whichever you choose, there's nothing quite like that moment when you first pop the cork. A bit of fizz always gets the party started. And if that's not enough for you on it's own, then why not try a Champagne Cocktail or two! Click here to go to Champagne Cocktails. Very interesting post, thank you. I love your champagne glasses, quite unique. 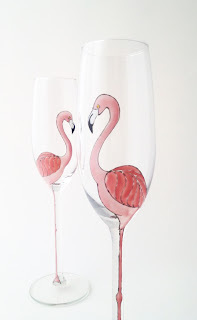 The flamingoes are my favourite, they really suit the glass well. Wedding preparation is certainly a difficult activity for the bride and groom, but the outcome could absolutely be worth it. 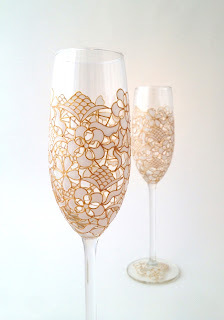 A wedding personalized champagne flutes is, indeed, a symbolic souvenir!